When we were first offered a review copy of Artisan Vegan Cheese, we were a little hesitant, but once we started reading it, we became intrigued and fascinated. We learned how to make all kinds of vegan cheese, from aged hard cheeses to soft quickly prepared cheeses and sauces, and how to incorporate them into other recipes, or serve by themselves at parties, for serving on crackers or bread or for including in sandwiches. 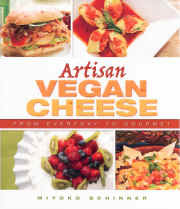 In Artisan Vegan Cheese there are even recipes for cheeses that actually melt. In addition to making the actual cheeses, Miyoko shows us how to make our own rejuvelac and yogurt, which she also uses to age and flavor many of the cheeses presented in her delightful book. She also has some milk recipes. Artisan Vegan Cheese is a must read book for anyone who doesn't eat dairy cheese for ethical or health reasons, but still craves the taste and feel of cheese. It is also a great reference book that really everyone should have in their cookbook collection. Miyoko Schinner has been a vegetarian for more than forty years and vegan for more than half that time. She is the author of The New Now and Zen Epicure and Japanese Cooking: Contemporary and Traditional. Miyoko has been teaching, cooking, and writing about vegan foods for more than thirty years and lives in Northern California with her husband, children, dog, cats, and pet chickens.